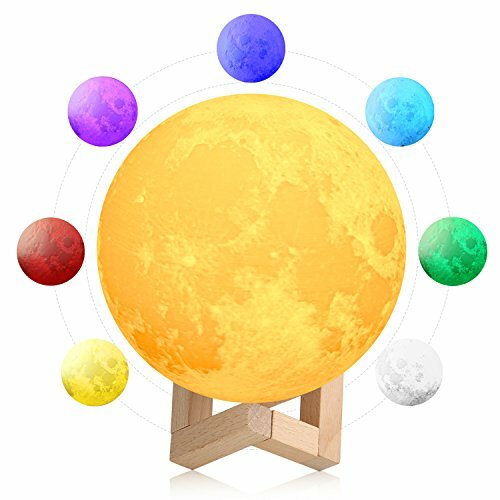 The Moon Lamp 5.9in set three light model, Pure White, Warm White and 7color change. Through the touch control switch to change color to the moon. change from dark to bright the cycle of change, in the condition of spontaneous breathing, continuous beating under the "two times", the brightness of the moon can be suspended. Adopting Low Voltage USB Charging and Energy Efficient LED Light Bulb, The Lamp Stays Cool Even After Long Time Use, and Gives Off Fliker-free Soft Light Which Would Not Hurt Eyes. PLA material extracted from corn stalks, hard and smooth, non-toxic, odorless, environmentally friendly. Print layer by layer, restore the real appearance of the moon. Touch switch the color and turn off the light. 250mAh built-in battery, after the full charge, the lamp can be used 4-20 hours. 3D moon lamp 5.9in design brings you mystery and romance. ♚ 【BEST GIFT FOR EVERYONE】: Moon lamp 5.9in Fit for Birthday, Valentines Day, Women's Day, Mother's Day, Halloween, Christmas, Holiday, Tourist attractions. Nice Decoration Lamp for kids room, living room, bedroom, cafe, restaurant, office, wedding, study, bar, shops, etc. If you have any questions about this product by Kingpeony, contact us by completing and submitting the form below. If you are looking for a specif part number, please include it with your message.